With episodes 1 and 2 of Telltale’s The Walking Dead: A New Frontier ending on such a strong note with a fantastic cliffhanger, episode 3 “Above the Law” has plenty to work with and gets off to a good start. Javier and company make their way to a new settlement only to find that his long lost brother David is not only there, but is an important high ranking official within the New Frontier. 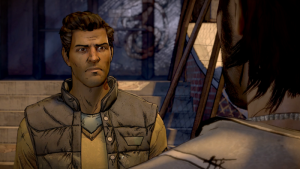 Telltale does a great job of building David’s character to be mysterious and possibly not trust worthy. The episode starts with main protagonist Javier and the remnants of his family with new found friends Tripp and Jesus immediately being locked up in a holding cell without any clear sign that they will be released even though the guy in charge is his brother. From there, the usual dialog options prompt with little evidence to show that your choices will really change the way you and your brother get along. In fact, it seems no matter how you respond the facial expressions you get in return stay tense, and it is just a matter of time before Javier and David come to blows. Telltale has done an excellent job with their use of fan favorite Clementine for this installment in the Walking Dead series. Even though she is not the main protagonist, she is a very strong support character and her involvement in the story moves it along quite nicely. She has issues with the New Frontier, which you learn about in a really smart and fun flashback, and more specifically David, Javier’s brother. She insists that you cannot trust him no matter how the scenario plays out. This keeps you constantly on the edge when it comes to fully trusting and interacting David even when it seems that you can, and seemingly should. Episode 3 also builds on the estranged relationship between Kate and David, and her desire to get away from him as soon as possible even after being separated for years due to the current state of the world from the outbreak. 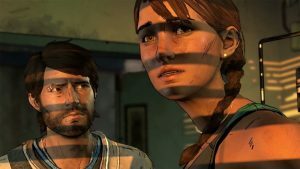 Telltale has done a good job of building Javier’s character by using family and how far you will go to protect them, all while leading to the inevitable fallout between David and Javier and ultimately who will end up with Kate. Unlike the last episode, this one tried to leave you with a big cliff hanger but didn’t quite hit a home run. I was actually caught off guard by how abrupt the ending came about. This didn’t kill the experience, but it defiantly left me saying “That’s it?” Again Telltale is in a good place to pick the story back up and hopefully will lift the curse of previous games and make episode 4 memorable and fun to play. Overall this episode runs great and looks fantastic. I did not experience any of the usual Telltale engine slow downs, framerate drops, or chugs. In fact the episode ran smoothly and never crashed, which unfortunately is saying a lot. Graphically The New Frontier is a great looking game and the story to this point has held up quite nicely compared to previous Walking Dead games. Overall this episode was a little short but definitely delivered and left me wanting more even though it had a lack luster ending.